Become King for the day and earn the richest regal rewards in Royal Spins online slot by IGT! This classic slot has 5-reels and 5-lines of action when connecting symbols like cherries, bells, crowns and oranges. The features of this game include a Cherry Bonus that awards a progressive reward, and the Crown Bonus that can award you with 10 free spins and up to 200x your bet! Cherry Bonus – Highlight all 5 cherries in the Cherry Bonus meter to win the progressive jackpot. Each time a 5 of a kind Cherry line win occurs, a single cherry is highlighted in the meter. Whenever a 7 symbol appears on a winning payline, the progressive amount increases by the number of 7 symbols on the payline times the line bet. 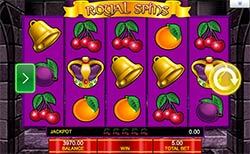 Crown Bonus – Land 3, 4 or 5 scattered Crown symbols on consecutive reels to trigger the Crown Bonus. The Crown Bonus is a free spins round where you’ll win 3, 5 or 10 free spins respectively. Additionally, you will earn instant scatter rewards up to 200x your bet for landing anywhere from 1 to 5 crowns.